In what may be a Windsor family first, Prince William will have to ask his guests to pass the tongs. That's because Kate and Wills have opted for a buffet-style wedding lunch rather than a lavish sit-down meal. 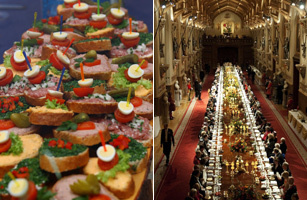 That marks a sharp shift from royal weddings past, where an opulent lunch spread was de rigeur and routinely featured dishes created specifically for the event and named after family members. The Queen Mother marked her 1923 marriage to the Duke of York with a spread that included Consommé à la Windsor, and Queen Elizabeth celebrated her 1947 nuptials to Prince Philip by indulging in Filet de Sole Mountbatten and a Bombe Glacée Princess Elizabeth. But the young couple will still get to indulge in a meal fit for a king on their wedding day. In the evening, Prince Charles will host a private dinner for family and friends, where waiters will keep the wine  and the lobster sauce  flowing.